Always register all your publications including articles, books, book chapters, conference papers, and thesis. Recently employed researchers should register all their publications published during the last five years. Before adding a new record into Haris, remember to check if it is already in Haris. This can be done in the public interface of the research database, available on http://haris.hanken.fi/portal. If your co-author has already registered the publication, it saves time and effort for everyone involved. Begin to register new research merits by clicking the green button “Add research output, activity, or project” in the right upper corner in Haris’s administration interface or the “+” sign when you hover over the left-hand-side Research output link. It is possible to import publications from an online source (for example, Scopus and Google Scholar) and from a file from other research databases or reference managing systems into Haris. Then you do not have to register your publications manually. This mainly applies to recently employed researchers who need to register retrospectively all their publications published during the last five years. Please contact haris@hanken.fi for more information and for help. If your publication is not indexed in another database, you need to register it manually. The following instructions are about how to register a peer-reviewed article (A1) and how to register an article in conference proceedings (A4), and about what information is important to add in Haris. The instructions apply to other types of publications. The Ministry’s publication types are relied on and the library makes the ultimate choice of the publication type. Read Publication data collection instructions for researchers 2018 (Julkaisutiedonkeruun ohjeistus tutkijoille 2018) by the Ministry to decide your paper’s publication type. • First choose the output type. For an A1 article, choose Contribution to journal and then Article. An empty template will open. Mandatory fields are indicated by a red asterisk *. • Set the Publication category as Scientific and then Peer-reviewed. The Ministry of Education publication type A1 Journal article – refereed will be chosen automatically. • You can add different Publication statuses and dates depending on if your article is In preparation, Submitted, Accepted or Published. The default setting is Published, which links to your article’s status in Haris (shown at the bottom bar of the template in dark grey next to the blue Save button) being set to “For approval” automatically. Note that note that only when the publication status is “Published” with the publication year filled in, can your article’s status in Haris be changed to “For approval” automatically. Other publication statuses will lead to the status “Entry in progress.” Please see more information about How is my publication’s registration approved? in Frequently asked questions about Haris. • In the section of Publication information, add the information about your article’s original language, title and subtitle, abstract, pages (start and end pages), and number of pages if you know them. • Add co-authors by clicking Add person. Type in an author’s name and Haris will check if it exists already in the system. If it does, choose the pre-existing one. 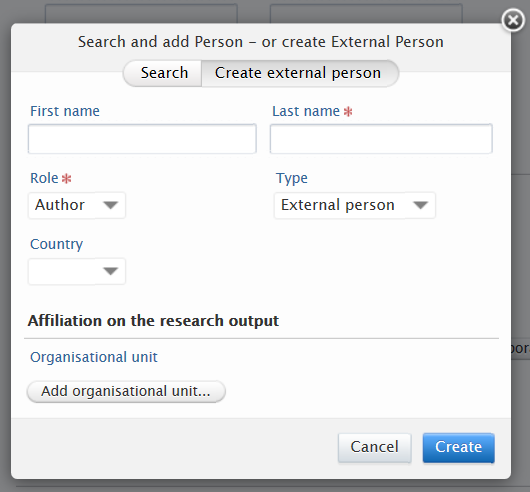 If your co-author is not in the system, please click Create external person. It is important to add the external author’s association/organization and especially the country. Authors should appear in Haris in the same order as in the publication. Use the arrows (↑ and ↓) to the right in the template for sorting. 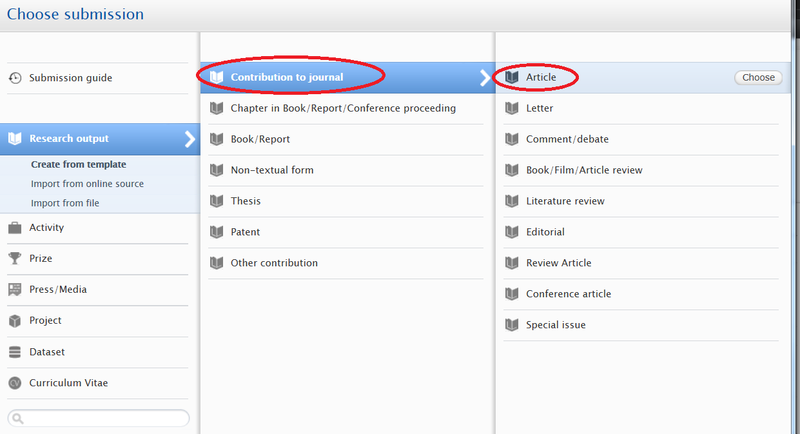 • Link the journal by clicking on Add journal to search for an existing title. 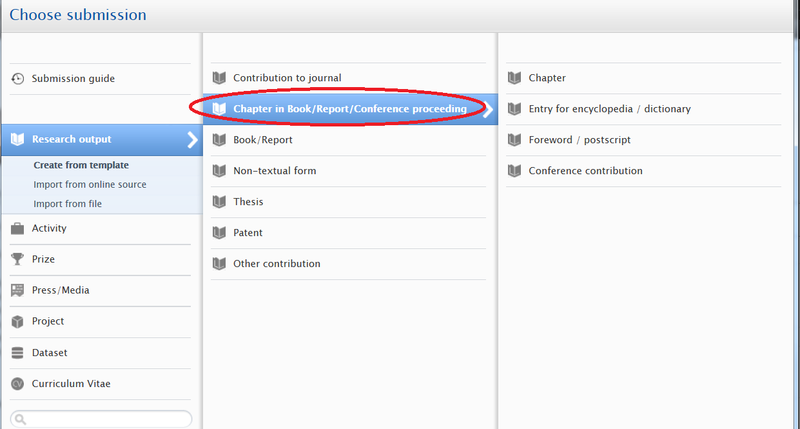 If the journal is not available in the list of results, add it by clicking on Create new journal (Books are linked to Publishers in the same way). Fill in Volume and Issue number if known. • In the section Access to fulltext, documents and links, you can add your article’s DOI number and upload a version of your article (usually the accepted version, post-print) into Haris, after clicking Add DOI, open access document or link. 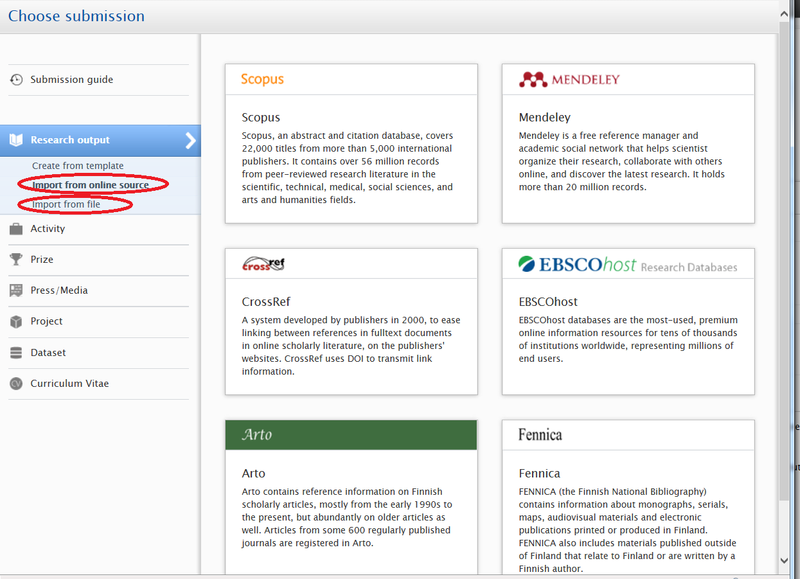 You can also add links to your article in other online sources such as Scopus by clicking Add other link. Note a DOI reference in Haris should always start with 10.XXXX, for example, 10.4018/IJESMA.2015100102. Do not add it as https://doi.org/10.4018/IJESMA.2015100102. Please see more information about How to self-archive at Hanken? • Choose fields of research by clicking Add keywords. The available list is appointed by the Ministry. Chosen fields (at most six) should describe the publication’s research fields, not the researcher’s. Mostly used at Hanken are 511 Economics and 512 Business and Management. Free keywords can then be added afterwards. • The default setting in Visibility is “Public – No restriction.” This is one of the requirements of the Bonus for scientific publications by the Hanken Foundation. • Remember to click the blue “Save” button to save your registration and changes. You can re-edit all your registered research output records at any time later by clicking on the title from your personal overview page in Haris. Here is how to register conference paper in Haris. Note those fields that are special with conference papers. The required fields are marked with a red asterisk *, but conference papers have certain fields that are not marked as being mandatory yet nevertheless should be filled in as carefully as possible. These fields are written in the following instruction in red. • First choose Chapter in Book/Report/Conference proceeding. Then according to the publication you are going to register, choose the suitable one from the given options, for example, Conference contribution. An empty template will open. • Set the Publication category as Scientific and then Peer-reviewed. The Ministry of Education publication type A4 Article in conference proceedings will be chosen automatically. If your conference paper is not peer-reviewed, choose Not peer-reviewed, and the Ministry of Education publication type B3 Article in conference proceedings will show automatically. • You can add different Publication statuses and dates depending on if your conference paper is In preparation, Submitted, Accepted or Published. • In the section of Publication information, add the information about your conference paper’s original language, title and subtitle, abstract, pages (start and end pages), and number of pages if you know them. • In the section of Titles of host publications, enter the host publication title, i.e., the title of the conference proceedings. If you do not know the title of the host publication, enter a fictional title, using the format “Proceedings of the 16th International Conference on ...” as a model. Enter the information you know about the conference publication: Publisher, Volume, ISBN, editors, or details about the series information. • In the section Access to fulltext, documents and links, you can add information about the full text version of your conference paper, if the full text is available. Please make sure that your entry does not violate any copyright law of the conference, for example, about uploading a conference paper into an institutional repository. Note that you are not supposed to upload the conference paper as a parallel copy in Haris in the case that, for example, you will contribute the paper to a journal later. If the full text of the conference paper is available, for example, on the conference’s website, please enter the link by clicking Add link to an electronic version. Add Link to the conference publication. If there is embargo, add the date before which the document should be unavailable (Embargo end date). Add under which license the document is made available (License to document) if you know. The Library also checks the publisher’s copyright policy. When the library has approved your article in Haris, the document will automatically be moved to DHanken if there is no embargo. In Haris the link to the Open Access version in Dhanken is automatically generated. The article is visible in DHanken in the collection Publications syncronized from Haris and linked to the subject’s collection. If there is an embargo period, it will not be moved before the embargo end date has passed. The administrator of DHanken also has the right to delete the document if it is a version not allowed. In that case the researcher will be informed. Please also see How to self-archive at Hanken? 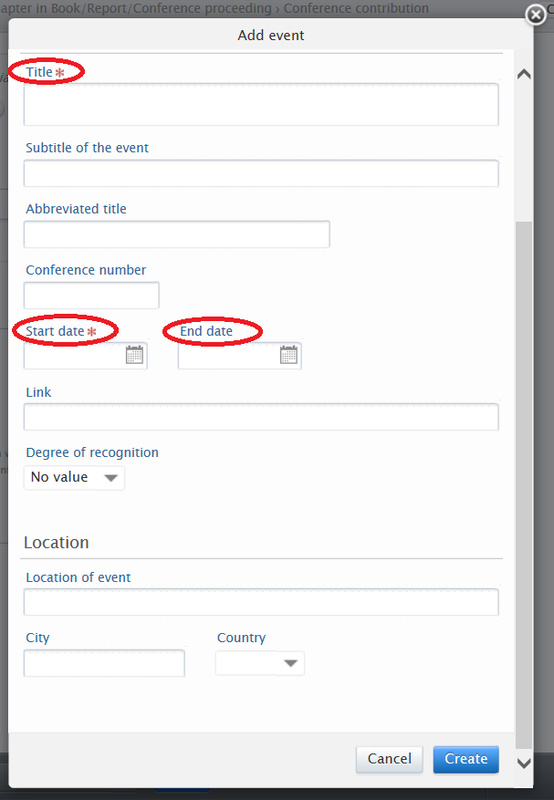 You can also add links to your conference paper in other online sources such as Scopus by clicking Add other link. • In the section of Event, enter the information about the conference. Click Add event. Type in the conference’s name and Haris will check if it exists already in the system. If it does, choose the pre-existing one. If the conference is not in the system, please click Create new. Start and end dates of the conference. The Degree of recognition (if the conference is International, National, Regional or Local). The Location (City and Country) of the conference. • The fields under Relationships are optional. The conference publication can be linked to, for example, activities, prices or projects. • Remember to click the blue “Save” button to save your registration and changes. You can re-edit all your registered research output records at any time later by clicking on the title in the overview page of your Research output in Haris.